Being a Jersey girl, I love bling (it’s a requirement if you live here)! So of course I adore The Gold Jellybean and her fun style. Starting with this statement making wall – see how to make a chevron wall of your own. 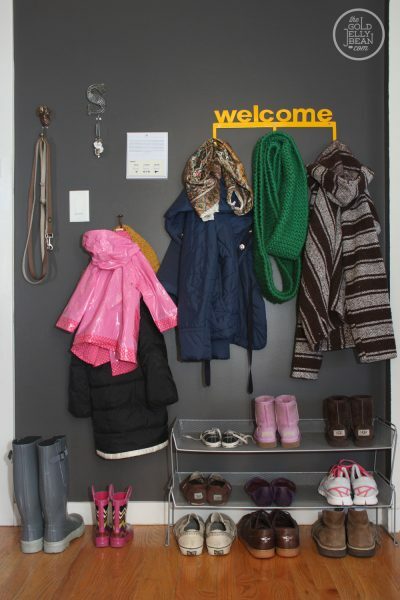 Shaleah is a designer and has turned apartment decorating ideas up a notch with her family friendly home. She is a firm believer that parents don’t have to sacrifice fun or style – and you can see she hasn’t. 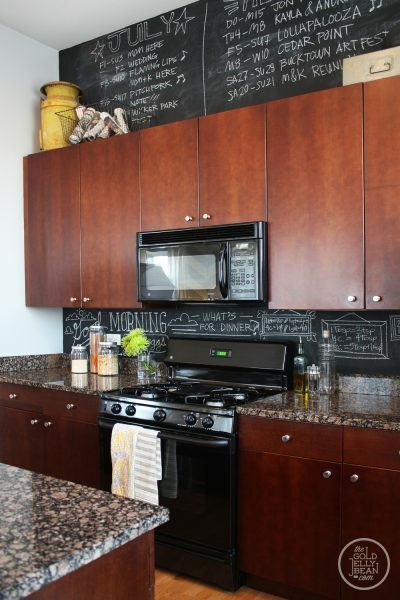 This chalkboard backsplash is my cup of tea. Love the dark walls in this bedroom. 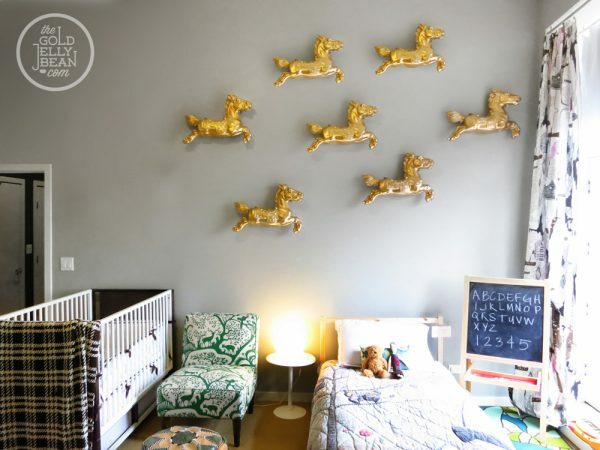 Every little girls wants a pony – and this little girl has seven (and they are bling ponies which makes them even better). 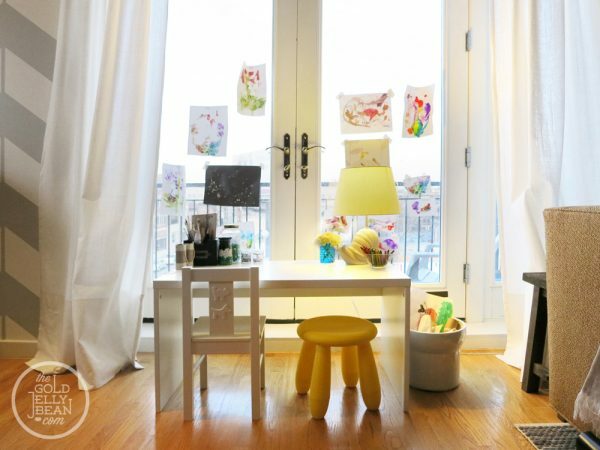 No spare wall space for your kids artwork? Hang it right on the windows. Not a lot of storage space? 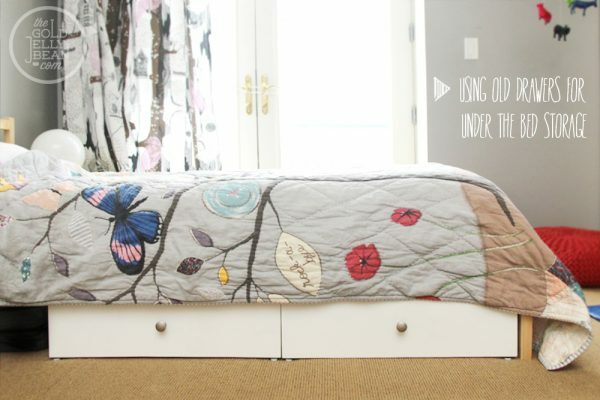 Try repurposing some old drawers into under the bed storage. Here’s to never sacrificing style. Stop by The Gold Jellybean for some more design ideas and fun things to do with your kids. Check out all of my Eclectic House Tours here. Love the blackboard paint in the kitchen. The bathroom that shower curtain!! love it. The chevron paint is cool but looks like a very time consuming project. Great fun style. Thanks for sharing this!! 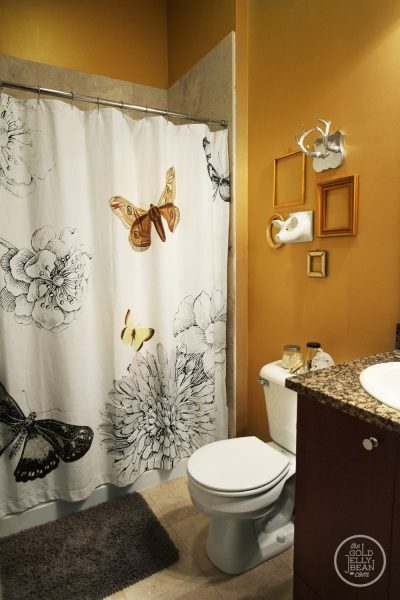 Love that shower curtain. Any idea about where to find one? Hope it’s not just sold in Jersey……but a trip could be fun! Thanks for the great home tours and your fresh, colorful style. Hi Tony – glad you like the tour! Click on the link to take you to the Gold Jellybean and you can ask her – I couldn’t find where she purchased the shower curtain – good luck! wow wow wow! love it all but the living and dining are my favorite areas! 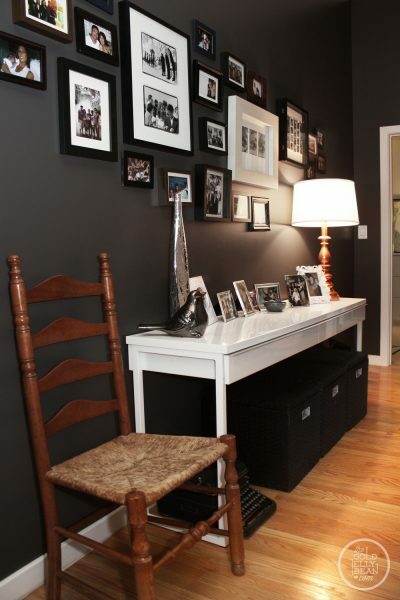 Whenever I see home tours I love to really look at what’s in a room, I get so many ideas to use or to inspire me. Love house tours. Really enjoyed it all. Happy Thanksgiving. Her house is really cool! I feel lots of energy in that house. I noticed a mix of furniture styles and yet it all comes together! Love the kids pictures on a clothesline in the window, and the chevron walls(brave). Chalkboard splashback and under bed storage are really practical! great ideas! Happy Thanksgiving! Love the home tours series and all the various styles! Love this home. Fun, lively and great use of color. 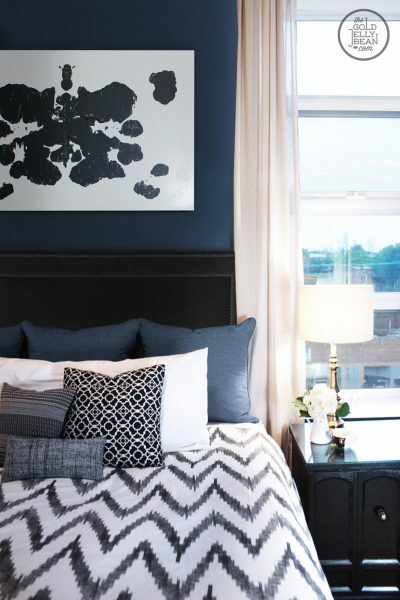 Pretty home – I love the dark walls in the bedroom! I have been considering painting my half bath metallic gold, love the one shown! After all, the throne room should have a gold standard! Love the oversized Rorshach print! What a very cool house.